Celebration of the weird and wonderful! New Year in Lofts is always special and euphoric, because it is the birthday of the arts factory and this year is also the anniversary - 5 years! Loftas New Year's celebration each year is inspired not only by a special theme, costumes, set design, but also fortified with a unique musical program. 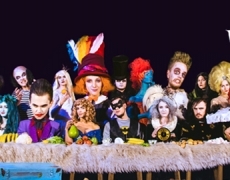 At the most amazing night of this year LOFTAS invites you to dive in the depths of fantasy and magic of the Tim Burton film characters: Alice in Wonderland, Edward Scissorhands, Charlie the Chocolate Factory, Sweeney Todd, Batman, Barbara & Adams and many others. New year at arts factory offers not only friendly bar prices, but also unites everyone by the party theme. Everyone is always changed beyond recognition and you just can’t imagine how it's worth a try. In addition, the author of the best costumes is always awarded a valuable prize. The winner Is elected on Loft Facebook profile after the holidays. Do not limit yourself at least one night a year!